"Držková" is also the name of a Czech or Slovak tripe soup. Držková (Czech or Slovak for tripe as a feminine singular adjective) is a village and municipality (obec) in the Zlín District in the Zlín Region of the Czech Republic. As of 31 December 2008[update] the municipality covers an area of 20.86 km2 (8.05 sq mi), and has a population of 356. 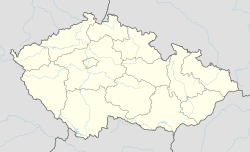 Držková lies approximately 15 km (9.3 mi) north-east of Zlín and 258 km (160 mi) east of Prague. ^ a b c "Vybrané statistické údaje za obec" (in Czech). Czech Statistical Office. Archived from the original on 10 February 2013. Retrieved 9 December 2009. Wikimedia Commons has media related to Držková. This page was last edited on 9 August 2018, at 22:00 (UTC).